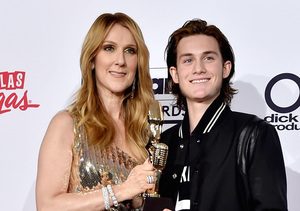 Singer Céline Dion has opened up on how she was unable to fulfill her husband René Angélil’s dying wish before he passed away in January. Dion told Paris Match magazine, "René wanted to die in my arms but, alas, I was singing that night. He must have wanted to get up and he fell on the floor. Normally, after my show when he had taken his last medications, I gave him a kiss, tucking him in and sent him off to sleep." Though Céline wasn’t able to be there when he died, she is fulfilling his other wish... to continue performing after his death. She has returned to her show at Caesars Palace and just performed Queen’s 1991 song “The Show Must Go On” at the Billboard Music Awards. Not only is Céline singing, she is also the executor of his estate. In his will, he left homes to two of his kids from his first marriage. TMZ reports he wanted $9 million from the sale of two estates to go into a trust, most likely for his children with Dion: René-Charles, Nelson, and Eddy. René also left furniture, cars, clothing, and jewelry to Céline.